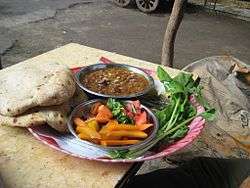 Typical fūl medames breakfast as served by an Egyptian street vendor with bread and pickled vegetables, as well as fresh rocket (arugula) leaves on the side. Ful medames (Arabic: فول مدمس‎‎, fūl midammis IPA: [fuːl meˈdæmmes]; other spellings include ful mudammas and foule mudammes), or simply fūl, is a dish of cooked fava beans served with vegetable oil, cumin, and optionally with chopped parsley, garlic, onion, lemon juice, chili pepper and other vegetable, herb and spice ingredients. It is notably a staple food in Egypt, especially in the northern cites of Cairo and Gizah. 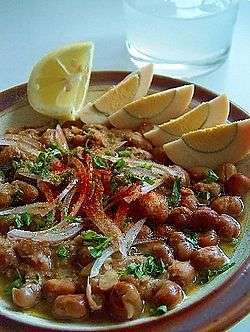 Ful medames is also a common part of the cuisines of many Arab, Middle Eastern and African cultures, including in Djibouti, Lebanon, Iraq, Syria, Libya, Palestine, Jordan, Israel, Eritrea, Sudan, Yemen, Somalia and Saudi Arabia. Some writers have suggested that Ful medames dated all the way back to Ancient Egypt. The earliest evidence of the use of ful is a cache of 2,600 dried wild beans unearthed at a late Neolithic site on the outskirts of Nazareth. This cooking method is mentioned in the Talmud Yerushalmi, indicating that the method was used in Horn of African and Middle Eastern countries since the fourth century. Although there are countless ways of embellishing fūl, the basic recipe remains the same. Once the fūl is cooked, it is salted and eaten plain or accompanied by olive oil, corn oil, butter, clarified butter, buffalo milk, béchamel sauce, basturma, fried or boiled eggs, tomato sauce, garlic sauce, tahini, fresh lemon juice, chili peppers, or other ingredients. In the Middle Ages, the making of fūl in Cairo was monopolized by the people living around the Princess Baths, a public bath in a tiny compound near today's public fountain of Muhammad ‘Ali Pasha, a block north of the two elegant minarets of the Mosque of Sultan Mu’ayyad Shaykh above the eleventh-century Bab Zuwaylah gate. During the day, bath-attendants stoked the fires heating the qidras, which are huge pots of bath water. Wood was scarce, so garbage was used as fuel and eventually a dump grew around the baths. When the baths closed, the red embers of the fires continued to burn. To take advantage of these precious fires, huge qidras were filled with fava beans, and these cauldrons were kept simmering all night, and eventually all day too, in order to provide breakfast for Cairo's population. Cookshops throughout Cairo would send their minions to the Princess Baths to buy their wholesale fūl. Fūl is prepared from the small, round bean known in Egypt as fūl ḥammām ("bath beans"). The beans are cooked until very soft. Other kinds of fava beans used by Egyptian cooks are fūl rūmī ("Roman", i.e. "European broad beans"), large kidney-shaped fava beans, and fūl baladī ("country beans", which are of middling size). Fūl nābit (or nābid) are fava bean sprouts, fūl akhḍar ("green fūl") are fresh fava beans, and fūl madshūsh ("crushed fūl") are crushed fava beans. 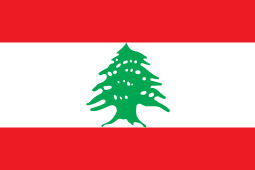 Ful medames was exported from Egypt to other parts of the Arab world, as well as other parts of Africa and Asia, but particularly to Lebanon, Syria, Palestine, Jordan, Israel, Yemen, Somalia, Ethiopia, Eritrea, Sudan and Libya. 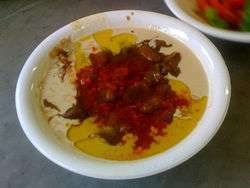 Ful is a popular breakfast dish in Syria, especially Aleppo. The fava beans are left simmering in large copper jars throughout the night, to be served from the next morning on; the beans swim in tahini and olive oil, completed with a hint of red pepper paste (made from Aleppo pepper) over the top. Ful is a very common dish in Armenia, however unlike most Middle Eastern countries, it is modified with more exclusive and rare spices. In Ethiopia (and Eritrea), ful is eaten with a pancake-like bread called (' injera '). Ful is served with standard flour bread, often providing a communal kitchen for patrons seeking to bake such types of breads. The beans are topped, or mixed with, a combination of oil and berbere. It is also part of the Somali cuisine, where it is served with Somali's traditional laxoox ((canjeero/injera)). In Malta, ful bit-tewm (beans with garlic) is usually associated with fasting during Lent and Good Friday. The beans are soaked in water overnight, cooked in oil with garlic and fresh or dried mint, then dressed with olive oil or vinegar before serving. ↑ James C. McCann, Stirring the Pot: A History of African Cuisine, (Ohio University Press: 2009), p.99. Wikimedia Commons has media related to Ful medames. Ottolenghi, Yotam. "The perfect hummus debate", The Guardian, June 29, 2010.